It's an avoidable occupational hazard that Chinese doctors could well do without: tuberculosis. 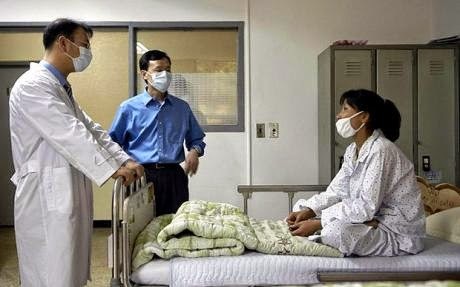 A study carried out in a general hospital in Henan has found that one in three healthcare staff have latent tuberculosis infection. The figures are even worse for a nearby infectious diseases hospital where almost 60% of doctors had latent tuberculosis infection. are not infectious and cannot spread TB infection to others. Overall, without treatment, about 5 to 10% of infected persons will develop TB disease at some time in their lives. So, people with latent TB do not pose a serious risk to patients, but they themselves face a high risk of developing active tuberculosis disease. In the study of 712 healthcare workers at a 1600-bed general hospital and a 600-bed infectious diseases hospital in Zhengzhou, researchers found that the tuberculin skin test-positive prevalence was 34% in the general hospital and 58% in the infectious disease hospital. Dr Zhou Feng and colleagues who did the study said that health staff faced high risks of tuberculosis if they worked with infected people, such as those with HIV who often have co-infection with tuberculosis. Rates of infection were also highest in staff with longer years of working in the hospitals, presumably due to greater duration of exposure to risk. Writing in PLOS One they said many staff did not use personal protective equipment such as face masks and N95 respirators when working with infectious patients, despite this being recommended in guidelines. Another problem with detecting and treating tuberculosis in healthcare workers was the low rate of tuberculin skin testing for the infection: many healthcare workers refused testing, and the most effective testing kits were too expensive for many Chinese hospitals. The findings also highlighted the limitations of the regular chest X-rays used to screen workers for active tuberculosis disease. "Comprehensive guidelines should be developed for different types of medical institutions to reduce tuberculosis transmission and ensure the health of healthcare workers," they suggest.